Iberostar Bavaro is located in Punta Cana, Dominican Republic, the land of white sandy beaches, turquoise waters and dreamy sunsets. This five-star all-inclusive resort is about 20 minutes away from Punta Cana International Airport, so you know your Caribbean vacation starts right after you deplane. 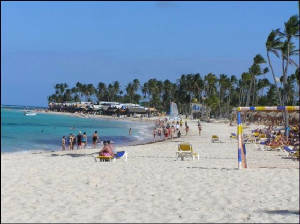 About two million tourists flock to Punta Cana every year to bask in the beautiful landscapes, try the exotic cuisine and visit reputable national parks. 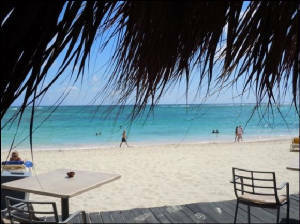 Not to mention, for the heavy dose of much-needed relaxation, adventurous water sports, and a happening nightlife. who'll recommend the best dish on the menu to even the décor made by artisans working right here, the message is Welcome. You'll find the local touch everywhere you look. Especially when you get to the quaint little shops on Caribbean Street, you'd think you were in Santo Domingo with its house-like shops in pink and blue hues. From the beauty parlor and spa, to an art shop and jewelry store, it's all right here for you to experience at this very first Caribbean hotel. you're used to like plush pillows, comfortable sheets, a cozy atmosphere, even a balcony or a terrace. From standard rooms to junior suites you surely won't be homesick. a hair dryer and satellite television. plus one international buffet and one grill snack bar. And by snack bars we mean giant buffets with salads, cheeses, meat carving stations, fish and deserts galore. Plus, with the help of a reservation or two, you can taste Cajun favorites like traditional jambalaya and duck breast plantation style. At iberostar Bavaro, food is king. 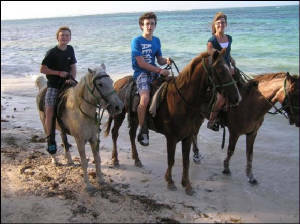 Entertainment: Iberostar Bavaro has lots of ways to keep your entire family entertained, you’re all on vacation after all. From parents who want to reconnect in bars and nightclubs. To a number of pools and live nightly shows for teens. And to Lucy’s Club, a friendly atmosphere for kids where they can read, color and watch movies. 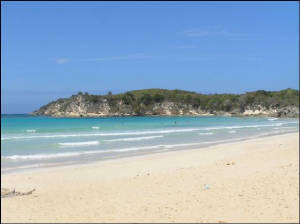 Plus, let’s not forget the crystal-clear beach where everyone can have fun. massage at the nearby world-class spa. 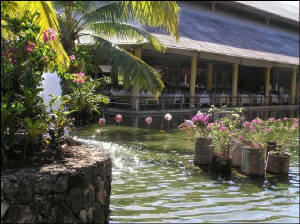 On premises there is a CDC PADI GOLD PALM RESORT DIVE CENTER, operated by Dressel Divers International. Our dive shop is affiliated to PAI, but also welcome divers from different dive organizations or federations. 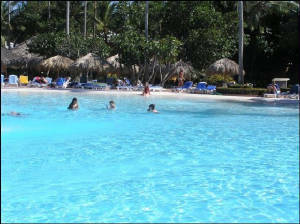 All Inclusive Plan: Iberostar Bavaro is truly the best value for your Caribbean vacation. With the all-inclusive model, we can give you more for your money. activities galore and nightly entertainment. 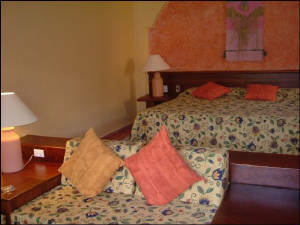 Plus, some of the Iberostar resorts also have 24 h room service with foods like wraps, salads and desserts on the menu. Just put on your bracelet for access to everything, including other Iberostar hotels. The flights: On time or early. Beach: Beautiful, they kept it clean - water was awesome. Service: Personnel very nice and happy! Any additional comments: Wouldn't recommend the VIP sting ray/snorkel excursion. The snorkel portion was good but it was depressing at the sting ray / shark exhibit. All the people were herded like cattle, had to sit very close together and do everything very precisely. Plus it took too long for the master of ceremonies to explain everything in 6 languages. Felt like I was in an outdoor jail. My daughter was so disappointed that she came with me instead of staying on the beach at the hotel. They could have separated the group into two sections (one with the sharks and one with the sting rays) and been a little more casual about being with the sting rays. One of the sting ray handlers was very rough with the ray he was holding. The other two handlers were more gentle and you could see they cared for the safety and health of the rays. Thanks so much, so glad to have used your services and really appreciate not having the extra travel agent "fee" tacked onto the price. Our trip was very enjoyable; everything went off without a hitch. I’m not sure if you know, but, Funjet has a representative at the resort everyday. His name is Miguel and he was very helpful. We have always had non stop flights, however, this time, we decided to connect in Miami in order to save a few bucks and I would not do that again. It made for a couple of long days and Miami is a terrible airport. You made a good call allowing 3 ½ hours between flights on the way back in order to clear customs. We have found that the Iberostar folks do a nice job and there was no disappointment, the rooms, food, facilities, beaches, entertainment were all great. This year they had a new thing, they had a nighttime beach party with a band and that was really a lot of fun, the only show we did not care for was the Caribbean Show. On a 1 to 10 scale all of the other shows were 9’s and 10’s and they were very entertaining. We thought about it, but, did not take any side trips, this time. Miguel indicated that some people got hurt doing the four wheelers, I thought you might like to know that. We did not participate in any of the activities, that’s just not for us. I will say…Iberostar put in a water park type thing for little kids. It’s a big ship in a pool that’s about a foot deep that water comes out of it and dumps everywhere; the kids (5 to 8 years old) seem to love it. I’m sure that makes it a little easier for moms and dads. Overall, everything was great and we would be glad to work with you again. Please put us on your list to keep in touch once in a while by email. If you have some kind of advertisement, I’d be glad to pass it along to some friends, family and employees. I hope this helps and thank you for doing a great job. we had to wait for another to drive in. They left us on the plane. Other than that, the flights were fine. Transfers: Fabulous ! Never a problem, they were there when they said they would be ! Very friendly. commenting that it was just this time of year because they had been there before and not had it. Not a big deal. Sand was amazing though! Pool: Outstanding !!!! Kids loved it, and so did we. Temperature was perfect. Always clean. Could almost guarantee a poolside lawn chair if out there by 8am. Also enjoyed the Dominica pool. Service: Outstanding !!! Asked for only diet soda and water in our fridge, slipped the guy a couple bucks, and it was perfect ! Cleaning service was great. Lobby service was great. Bar service was great ! Food: WOW. Fabulous. My teenagers were in heaven at the buffet ! I loved the sweets. We ate in the steakhouse, it was ok.
asked for them cooked over hard, never a problem. My son wanted plain scrambled, not a problem. They were always accommodating. Loved the mango smoothies. The melon carvings at the dinner buffet were amazing. had air and ceiling fan on high and you could barely even feel it. Entertainment: not much. We started to get restless after being on cruises for the past 4 years. I really need a more teenager active resort. We were bored after sunset. The theater/shows were very poor. We would like a comedy show or magic or current music or something. My kids were bored and so were we. 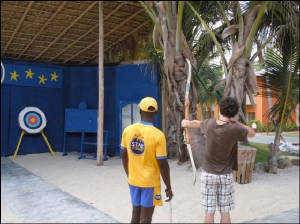 During the day, the boys did pellet guns and archery. One day they had a kayak race in the pool which we did and was fun. But we would recommend this resort. Your service was excellent! We will definitely be referring you to our family and friends! 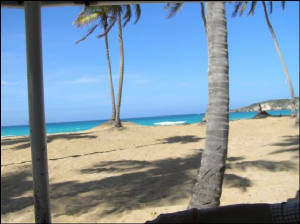 sampled sugar cane, watched cigar making, went to a beautiful beach and really enjoyed that ! booked these thru the funjet guy at the hotel. I know when you are on vacation and should not be on the internet, but I had 2 teenagers and we had to purchase internet in our room. time to check my own emails. 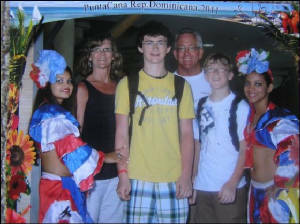 We are interested possibly in Jamaica for next year Spring Break, but we MUST have more of a teenager active resort, sticking with all-inclusive. Not sure of school schedule yet but will be looking very soon. Thank you for all your help booking this trip, it was great. to give us a shot of some disgusting looking drink on the way to the hotel which I’m sure he then would have been liked to have been paid for). They also showed up on time to bring us back to the airport. they try to sell excursions. We passed on this and told them it was our 6th time to the hotel. She validated our transfer but didn’t seem too happy. We would retun again and ABSOLUTELY recommend it! As always, your service is outstanding. We will continue to refer our family and friends your way! 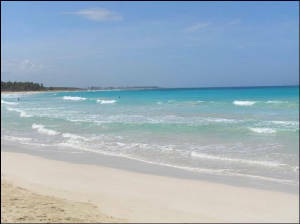 BEACH: Nice, although the waves not as calm as in other Carribean islands. SERVICE AT RESORT: Most friendly and happy staff. Hard workers, always try to please. ROOMS: Very nice. Good space. Need more drawers though. ENTERTAINMENT: They really try hard to put on the shows. We would absolutely return and highly recommend this resort and your service! Frank was great & informative. The flights: wonderful, all flights were on time. 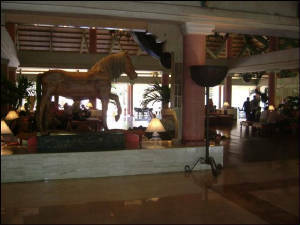 Transfers: the transfer to and from the Punta Cana airport/hotel were great. Beach: Excellent, the beach was beautiful and clean. Pool: very good, not crowded at all. It was very clean and well maintained. Service: All of the service was excellent. Food: An enormous amount of food to choose from. The food was great at every meal, from the buffet to the specialty restaurants. room would be available on Friday and we could change rooms then. The staff was very accommodating in changing rooms. Entertainment: The entertainment was good. Jamie and I will defiantly go back. A matter of fact, we were talking about going back, before we even came home. We really enjoyed everything. 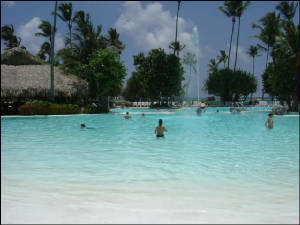 We highly recommend the Iberostar Bavaro resort, I just can not say enough how much we loved everything. You guys are the best. You answered every question and concern that we had. I could not ask for a better travel agent. We are already giving your name and phone number to friends since we returned from our trip. Thanks for helping make this a very special vacation for the two of us. I did not know that Jamie and I could have so much fun. We saw and did things that I never dreamed of doing. Thanks again, you guys are GREAT!!!!!!!!!!!!!!! I have to tell you that you are a very good read - you took all the information I supplied you with and steered us to just the right hotel. CHECK IN: There was only one staff person I felt was unresponsive and uncaring. The fellow who checked us in and checked us out. I wanted to move to the second floor so that we could keep curtains open to help let sunlight in. This fellow was the tomorrow, tomorrow. showed it with smiles, hellos, a bit of dancing and singing. of the cheese table, and neither can Ralph. 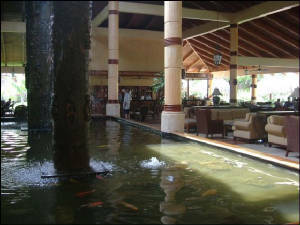 We ate in the Bavaro's three restaurants the three allotted nights, and they were great. were cold, unfortunately, but tasty. It's too bad that so many restaurants all over the place just can't get it right when it comes to that. with no reservation and they weren't been counted against their allotment, and the room service was not explained. I had understood that room service would have counted as a restaurant reservation, but it was not made clear at all. So we stuck with our three nights. you must travel, you have to wear your seatbelt which obviously constrains picture taking and viewing of the landscape since you have to sit facing in. you can strain to find a window on the bus from which to shoot, you know what I mean, so I didn't bother. Luis was extremely knowledgeable, it was worth it. Since school was not in session, they brought us to a beach where people could boogie board. they would stick to you like glue, not the case at all. Not bad or good, just interesting. CASINO: Ralph and I only lost about $300 at the casino (Dominicana),and I think Bob did fine at the tables. We definitely will go back! Since we traveled over the holiday, I think that makes a difference as the resort was full. After our return, I already have 2 people here who will contact you!